Dedicated to the memory of George Lefevre in recognition of his exhaustive cytogenetic analysis of the X chromosome, The Genome of Drosophila melanogaster is the complete compendium of what is known about the genes and chromosomes of this widely used model organism. 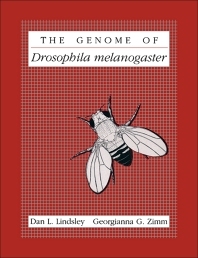 The volume is an up-to-date revision of Lindsley and Grell's 1968 work, Genetic Variations of Drosophila melanogaster. The new edition contains complete descriptions of normal and mutant genes including phenotypic, cytological, molecular, and bibliographic information. In addition, it describes thousands of recorded chromosome rearrangements used in research on Drosophila. This handbook and its accompanying polytene chromosome maps, are sturdily bound into the book as foldouts and available as a separate set, are essential research tools for the Drosophila community. Genes. Chromosomes: Deficiencies. Duplications. Inversions. Rings. Translocations. Transpositions. External Anatomy (figure). Normal Chromosome Complement. Special Chromosomes: Balancers. Compound Chromosomes. X-Y Combinations. Y Derivatives. Autosynaptic Chromosomes. Transposable Elements. Departures from Diploidy. Satellite Sequences. Nonchromosomal Inheritance. Cytogenetic Map. University of California at San Diego, La Jolla, U.S.A.